Kawasaki’s unveiling of its concept car, J Vehicle, at the Tokyo Motor Show this year, captivated many hearts and minds, and drew some gasps from those who were in attendance. On first look, a person is bound to think whether the bike has 2 or 3 wheels. 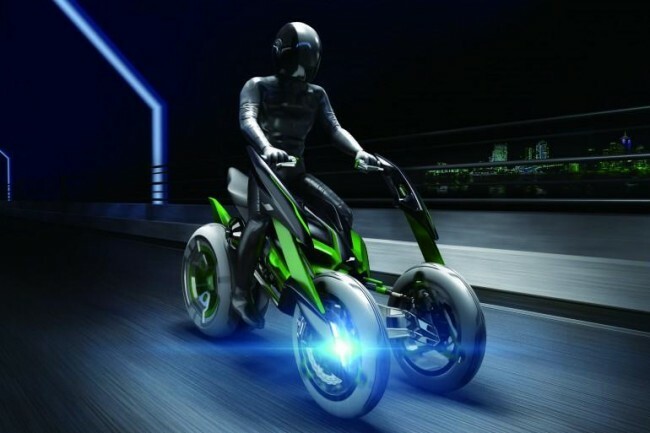 According to the pictures released and explanation given by Kawasaki’s representatives at the Tokyo Motor Show, the J Vehicle, makes use all of its 3 wheels in a mode called “Sports Mode.” The front wheel, as can be seen in the picture, separates in the “Sports Mode” and the bike levels down from its upright position. The handle bars are not connected together; in “Sports Mode,” each handle bar is connected to the front wheels. Apart from “Sports Mode” is the “Comfort Mode,” in which both the severed front wheels are joined, and the bike becomes a conventional two-wheel bike. The bike is powered with Kawasaki’s greatest battery pack, the Gigacell. The J Vehicle looks like an incredibly powerful bike accompanied by an aesthetic visual appeal, but as with all concept cars, the J Vehicle won’t ever make it to people’s garages.